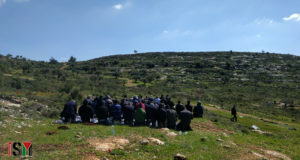 Within minutes of our arrival in Tuwani, in the south Hebron hills of the West Bank, an army Jeep rolled into the village and shattered the mid-morning tranquillity. “We’re turning this place into a closed military zone,” announced the stern-faced commander to anyone within earshot. Brandishing his rifle in one hand and a military document in the other, he proceeded to explain that “I decide who can be here and who can’t, and anyone who isn’t a resident has to leave immediately”. That meant us – me, my friend and our three guides from the Villages Group – as well as the other activists who maintain a permanent presence in Tuwani assisting the locals in their struggle to survive. 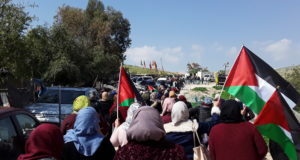 The timing of the closure was no accident: earlier in the morning NGO workers and locals had taken part in a solidarity march to highlight the hardships suffered by the village children who run the gauntlet of the neighbouring settlement every time they walk to and from their school. The shutdown of the village and the surrounding farmland was only the latest in a long line of attempts by the Israeli authorities to break the will of the Palestinians living in the area. As we drove out of Tuwani, we were shown the stump of an electricity pylon sawn down by the army after attempts by villagers to connect themselves to the national grid. Elsewhere, dirt mounds and locked gates stopped locals driving to the nearby city of Ya’ta, thus preventing them taking their produce to sell at market, and severely impairing their economic prospects. Thanks to the army’s exclusion orders, we were forced to walk a treacherous and convoluted route through the rocky scrubland to visit communities living in even deeper seclusion beyond Tuwani. In Tu’ba, the cave-dwelling residents of the village are under no illusion about what the future holds for them, despite all the hype surrounding the much-vaunted settlement freeze. “The freeze will have no effect round here,” the father of the household told us bitterly. Our guide expanded on the theme, telling us that the “real freeze is on Palestinian construction: 95% of Palestinian applications for building permits in Area C are denied by the civil administration, and for communities in this area they are not allowed to build above ground whatsoever”. Those people living in caves are, it seems, tolerated by the authorities while they remain underground, but as soon as they put their heads above the surface and attempt to build rudimentary shacks and outhouses, demolition orders are served and the army are quick to enforce the letter of the law with gusto. Meanwhile, in the neighbouring settlements of Carmel and Ma’on, building work was going on in earnest, and defiant banners on bus stops and fence posts declared the settlers’ intention to “smash the freeze”, and denounced the incumbent government as traitors to the Zionist cause. While government inspectors have been attacked during their attempts to bring settlement construction to a halt, the full force of the settlers’ wrath has – as ever – been meted out against the Palestinians. As we sat with the head of the Bedouin clan living in Um al-Kheir – a collection of tumble-down tents and shacks literally touching the perimeter fence of the Carmel settlement – the mood of resignation engulfing the encampment’s residents was suffocating. We were shown aerial photos of Um al-Kheir’s gradual demise over the past 30 years, a situation attributable to the encroachment of the settlers and the military on to their ancestral land. It was clear that for those forced to endure the humiliation and hardship on a daily basis, the politicians’ upbeat talk was at best cheap, and at worst a flagrant denial of the facts. 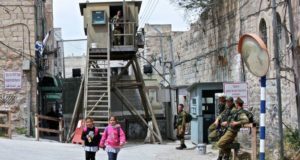 For those Palestinians living under military rule, coupled with indiscriminate and incessant settler attacks against them, their children and their flocks, there is no end in sight to the suffering. While the world might have been convinced that the worm is about to turn in the Israeli political arena, a quick glance at the fevered construction still taking place in the settlements, the oppressive military activity against the Palestinian villagers and the overarching penury in which the Palestinians are forced to subsist should give onlookers food for thought about the true situation on the ground. Freeze or no freeze, the future looks no brighter for the Palestinian locals today than it has during any of the bitter years and decades gone by.